Share the message of your congregation with streaming solutions created specifically for Houses of Worship (HoW). Inspired by our wildly popular Dude Pack equipment bundles, our House of worship (HoW) streaming bundles provide all of the necessary gear to broadcast and deliver your message to your congregation. Available in a variety of configurations and price points, Stream Dudes provides houses of worship with simple options for selecting the right equipment. Most importantly, because we understand that budgets can be tight, we are always willing to allow for some customization to create the streaming package best-suited to you and your extended congregation’s needs. 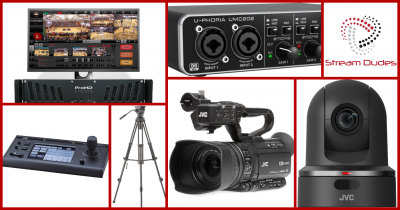 HoW Simple: Acquiring video equipment for your first webcast is always a bit intimidating and raises a lot of questions regarding future flexibility. Our HoW Simple package truly lives up to its name by making streaming as easy as possible. Using the SlingStudio Hub as your base unit, two ultra-compact high definition (HD) cameras are wirelessly connected, making shot placement easy and flexible. Although this solution is compact (a perfect on-the-go solution for retreats, seminars, or for streaming live outreach in the community), it still produces a quality output and makes sharing your message with your congregation and the world easy and affordable. HoW Clever NDI: Big things can come from such a small package, and our Dude Nano proves it. Fitting within the palm of your hand, The Dude Nano allows you to take in (2) cameras via SDI or multiple sources via NDI (like a feed from ProPresenter) or other cameras. Designed for ease of install, the HOW Clever bundle features (2) PTZOptics 20X Cameras with NDI and a PoE Switch- making a single-cable install possible. 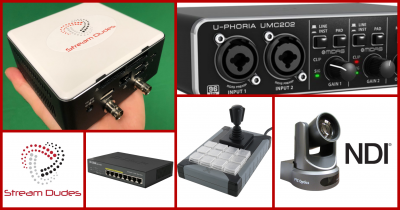 Camera control is made easy with the included programmable joystick for use within the included vMix 4K software. If you are ready to take your congregation’s streaming to the next level, the HOW Easy Clever NDI makes upgrading easy. HoW Thoughtful: Upgrading equipment always comes with it’s share of questions when it comes to future expansion. The Dude PCs are built to grow with your needs and designed with your future in mind. 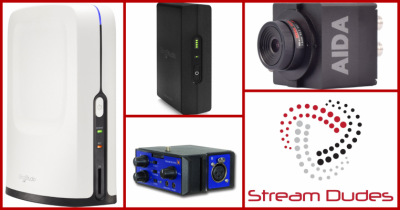 Thinking about investing in a complete streaming solution? Our HoW Thoughtful bundle utilizes the 6-Core power of our Dude PC, vMix 4K software, the sharp optics of the JVC GY-HM180 Cameras, and the convenience of a four-person wireless com kit. Complete with a mixer, tripods, and a control surface, HoW Thoughtful is a perfect streaming solution for any venue that desires to start out on the right path. Compared to other big name, all-in-one video production solutions, the HoW Thoughtful bundle is tough to beat for the price. HoW Impressive: Getting the most for your congregation shouldn’t require difficult to use equipment. JVC feels the same way and has created the ProHD Studio 4000 with simplicity in mind. Using a touchscreen, you can switch, stream (up to five destinations simultaneously), create picture-in-picture shots, and even control necessary CCU functions with a single touch. Our HoW Impressive bundle also includes the JVC RM-LP100 IP Controller, making PTZ camera movements controlled and straight forward. Since all of the packaged cameras include IP connectivity, all camera control and adjustments can be made from a single location. This professional-grade solution will surely “impress” your congregation and live viewing audience- all while being easy-to-use. 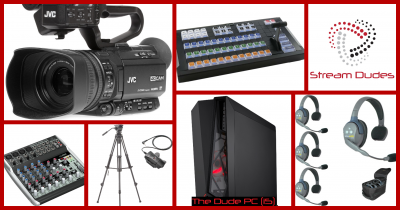 Whether you are a video professional seeking to upgrade your current workflow to high definition (HD), or even 4K; or a hobbyist looking to get their congregation streaming video for the first time, Stream Dudes is here to help. Our team has extensive experience with web streaming and is available to answer your questions.